Since my husband and I met, I have spent Labor Day at his parents' place in Fire Island. Fire Island is a charming beach community where shirt and shoes are definitely NOT required. There's a bay, a beach, no cars—and most importantly for lately—a kiddie pool. It’s a place that really makes you feel you're on vacation from the City. This year, however, is the first year in 14 years that we will not be there. It’s for good reason; our babies are coming home from the hospital after seven weeks in the NICU! I’m definitely sad I won't have my toes in the sand, but I’m also ridiculously excited to have our whole family together. And let’s be honest—totally overwhelmed and anxious about having three kids in diapers taking over our tiny apartment. Having kids is wonderful. But it's also hard, and it changes everything. For instance, sometimes you don’t get to do the fun things you once did. In the past, Labor Day not only meant fun on the beach, but also grilled pizzas with fresh pesto. So I say, "Don’t let go!" Yes, we are in Manhattan instead of a three-block-wide island. And no, we don’t have a grill. 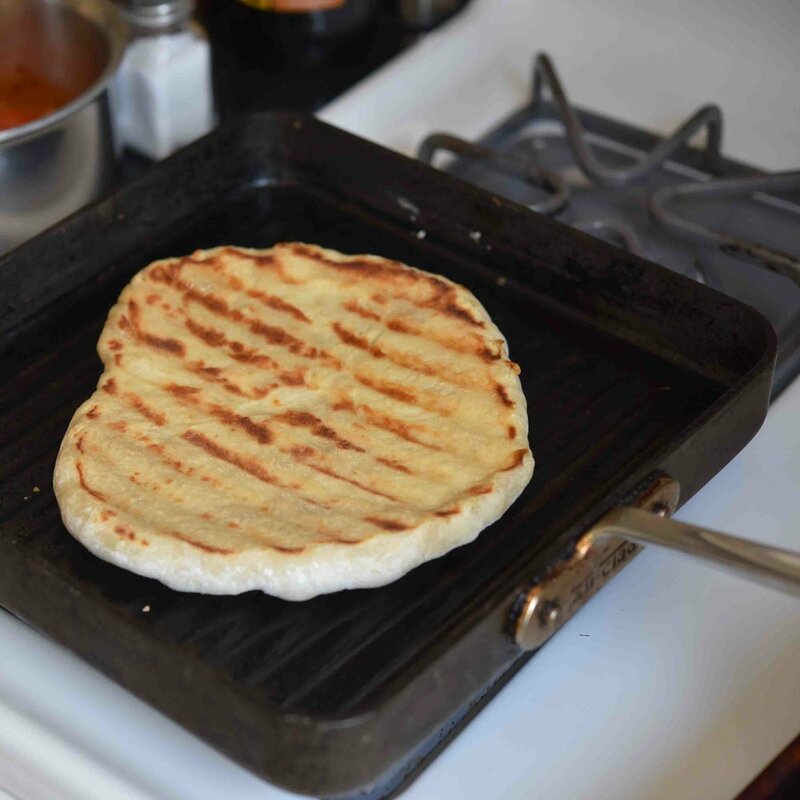 But we can still make grilled pizzas just like we do every Labor Day. I’m pulling out the grill pan, throwing on some store-bought pizza dough, topping it with fresh basil pesto and tomatoes, and breaking open the Prosecco! Now I just have to blow up my $6 inflatable kiddie pool, kick my shoes off, wipe the spit-up off my shoulder, and enjoy a different—but equally lovely—Labor Day weekend. Place the basil, spinach, Parmesan, pine nuts, and garlic in a food processor or blender; process until finely chopped. Then, with the machine running, slowly add ¼ cup of the olive oil; add up to another ¼ cup as needed—you want the pesto to be loose and pourable. Taste the pesto to see if it needs salt (this will depend on how salty the cheese is) and if it does, add ¼ to ½ teaspoon, tasting again as you go. Add 1 tablespoon of the olive oil to a small saucepan over medium heat, then add the tomatoes, garlic, and salt, cooking until the veggies are very soft—about 15 minutes. Break up and smush the tomatoes with a wooden spoon until they are saucy, but not wet—about 5 minutes more. 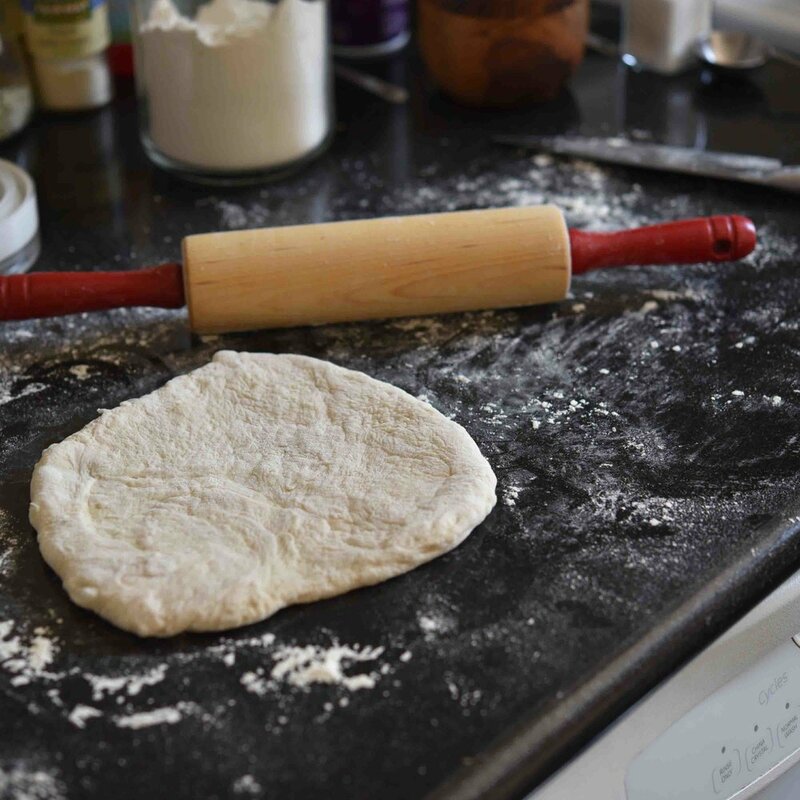 On a well-floured surface, roll each piece of dough into an 8-inch round about ½-inch thick. Heat a grill pan over medium-high heat, then brush it with 1 teaspoon of the olive oil. Brush one side of one dough round with another teaspoon of oil to coat it, then place it oil-side down on the grill pan. Cover it (using a sheet pan if your grill pan does not have a lid) and cook until deep grill marks appear on the bottom—6 to 8 minutes. Then oil the top side of the dough round with another teaspoon and flip the dough over on the grill pan. Spread 2 tablespoons of the pesto on the dough, then half of the tomato sauce, and finally 2 ounces of the cheese. Cover the dough and cook until the cheese is melted and the dough is fully done through—another 6 to 8 minutes. Repeat Steps 3 and 4 with the second dough round. If the grill is darkening the pizzas too much before they are cooked through, you can finish them in an oven preheated between 350° and 400°.